How did you become saved? Did you admit you were a sinner, repent of your sins, believe Jesus Christ died for your sins, and call on the Lord and pray to accept Jesus into your life? The resolution, which passed Wednesday by a majority vote of around 80 percent, affirmed the belief that "repentance from sin and personal faith in the Lord Jesus Christ are necessary for salvation." Citing Romans 10:13, it also affirmed that "repentance and faith involve a crying out for mercy and a calling on the Lord," more commonly known as the "sinner's prayer," as a "biblical expression of repentance and faith." One strong caution in the resolution: "The 'sinner's prayer' is not an incantation that results in salvation merely by its recitation and should never be manipulatively employed or utilized apart from a clear articulation of the Gospel." The resolution was introduced by Eric Hankins, pastor of First Baptist Church in Oxford, Miss., in the wake of an increased concern among Southern Baptists holding a traditional view on the doctrine of salvation over the increasing role and influence of the "New Calvinism" movement in the denomination. David Platt, one of the leading Calvinist or Reformed Theology pastors in the SBC, ignited a fiery debate over the sinner's prayer when he referred to the sinner's prayer as "superstitious" during a Verge Conference in March. "Should it not concern us that the Bible never uses the phrase 'invite Jesus into your heart' or 'invite Christ into your life'?" said Platt as his voice quivered with emotion. "It's a very dangerous thing to lead people to think they are a Christian when they have not biblically responded to the Gospel ... It's not just dangerous. It's just damning." In response, Hankins also co-authored a statement against Calvinism that was signed by several former SBC presidents. The document, titled "Statement of the Traditional Southern Baptist Understanding of God's Plan of Salvation," emphasized that God desires for every person to be saved and that the Gospel is the good news that God has made a way of salvation through the life, death, and resurrection of the Lord Jesus Christ for any person. 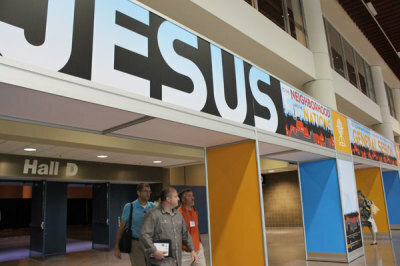 Although the Committee on Resolutions removed language pertaining to the growing number of Calvinists in the SBC, the final resolution on the sinner's prayer expressed the same anti-Calvinist sentiment. Among delegates who argued in support of the sinner's prayer was Steve Gaines, pastor of Bellevue Baptist Church in Cordova, Tenn. He said he believes that every one of the 256 kids who were individually counseled and led in the prayer at Vacation Bible School over the past few weeks has been saved. "Many of them were not ready and we said you're not ready. I don't believe you try to pick unripened fruit," Gaines told SBC Talk following the resolution vote. "But I am telling you that there is a particular, puncticular moment that you cross over from being lost and you're saved." He added, "I believe what we're dealing with is the whole idea of how you get saved: It's soteriology. I believe the biblical pattern is you hear the Gospel, you repent of your sins, you believe in the Lord Jesus and you call upon his name and at that split-second, that nano-second you're saved and forevermore you belong to Jesus." Dr. Richard Land, president of the Convention's public policy arm, The Ethics & Religious Liberty Commission, agreed with Gaines that those kids are now born-again Christians. "I think they are saved. Most Southern Baptists think they are saved. The Calvinists may not think so but they are the minority," Land told The Christian Post. "I believe that the Holy Spirit tries to convict all men. If a person is concerned about their eternal destiny, like Woody Allen seems to be concerned with his eternal destiny, that's the Holy Spirit trying to convict him, trying to bring him to a place where he will accept Jesus as his Savior." Land, who is CP's executive editor, added, "And when we attempt to believe, I believe God gives us saving grace. And so when we ask Jesus into our heart, I believe he comes into our heart and gives us saving faith." The sinner's prayer resolution, he said, is a "pushback" to Calvinists within the SBC who argue that only the Elect can be saved. He explained, "You have some Southern Baptists who are saying you can't ask Jesus into your heart –you have to wait for the working of God's grace. Whereas, people – like me – who aren't Calvinists would say the natural man doesn't understand the things of God for they are spiritually discerned but if the Holy Spirit convicts you and you feel convicted then you can say, 'Lord come into my heart' and the Lord will come into your heart." Gaines also responded to Calvinist arguments by saying that the Bible repeatedly affirms the concept of Christ coming into our hearts. He pointed to Scripture from both Testaments, including Jeremiah, where God says he will write on their "hearts," and the Gospel of John, where the Greek word "lambano" means "to receive." "I think that it is a very biblical concept to ask Jesus to come into your heart," said Gaines, who has been a preacher for 35 years. "Salvation comes as a response from repentance and faith. Nowhere in the Bible does it say that God regenerates you, and then you repent and believe," he said. "It's always repentance and faith are prerequisites – not the products of regeneration – but prerequisites for regeneration." Gaines addressed other concerns surrounding the sinner's prayer, including the argument that it can be a mindless prayer or that it can lead to "Easy Believism" – the belief that one can simply believe in order to be saved without living out a committed life of Christian discipleship. He said many people who are skeptics of the sinner's prayer argue it doesn't work because they know people who prayed it but "obviously didn't mean it because they didn't grow in grace and become a true Christian." Gaines suggested that the issue shouldn't be questioning the sincerity of the prayer but how to better disciple those who have become Christian. "That doesn't mean that the prayer didn't work," he said. "That just means that maybe they didn't get mentored of discipled and it may just mean that they didn't have someone to sit down with them after they prayed to receive Christ. They got born-again but they just stayed as a babe. They didn't grow and mature because they didn't learn to read their Bible, pray and witness and those things." RESOLVED, That we call on Southern Baptists everywhere to continue to carry out the Great Commission in North America and around the world, so that sinners everywhere, of every tribe, tongue, and language, may cry out, "God be merciful to me a sinner" (Luke 18:13). READ: IS SALVATION A MATTER OF BELIEVING THE RIGHT THINGS? Can Deliberate Sin Negate Your Conversion Experience?